The E69F Field-Mounted Current-to-Pneumatic Signal Converter accepts a standard direct current input signal and converts it to a proportional pneumatic output signal for use with other pneumatic instruments or control valves. As symbolized by the “CE” Logo marking on the product, this product conforms to the applicable European Union Directives. The E69F Converter is a small, compactly designed device which is very simply connected to both electrical and pneumatic interfaces. 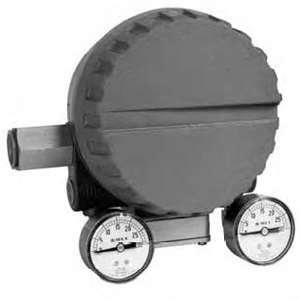 It can be easily mounted to a surface, a valve yoke, or to a nominal DN 50 or 2 in vertical pipe. The design of the galvanometric motor in the E69F Converter provides for generous clearances between coil and housing. Normal atmospheric changes which may cause corrosion and dust particles do not hinder operation of the mechanism, as sometimes happens with voice coil type instruments. Choice of input and output signals, split input ranges, as well as direct or reverse action, makes this converter easily adaptable for a wide range of applications. Output signals are available to make this converter particularly suitable for use in valve applications.